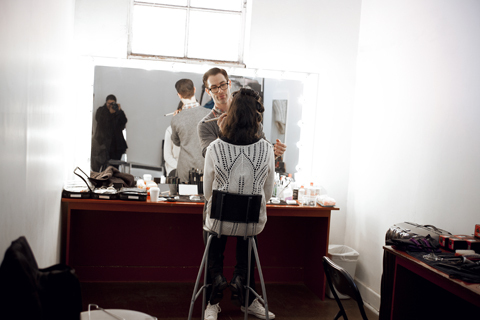 The studio has a separate makeup room and models change room complete with large, well lit mirrors and benches. There are two ‘tall’ makeup chairs to make applying makeup on the models easy for the makeup artist so they don’t need to bend over. There are also regular height chairs, again to make it easier for the hair stylist when styling hair. The makeup room is also fully heated and air conditioned to provide the perfect working conditions no matter what time of the year your shoot. 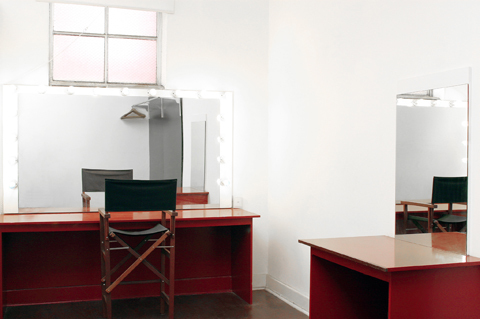 The makeup room also doubles as a change room to allow privacy for the talent during a wardrobe change. It is fully equipped with a generously sized and sturdy wall mounted clothes rack, which is approximately two metres long. There is also an iron and ironing board, clothes hangers and a clean a cosy dressing gown for the models to throw over their shoulders between shots and during makeup touch ups if need be. The makeup room/models change room measures 2.38m wide x 5.81m deep and can comfortably accommodate 2-3 models at one time.